Whew! What a time we've had the past couple of weeks. 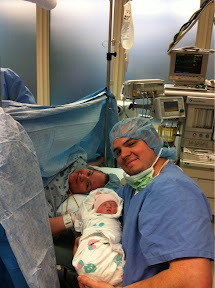 On May 14 at 9:15am Scarlett Mae Ellis came into the world. Tyler brought Tristan to see her that night since he had never been apart from me for a night and I was afraid of what he would think after a night apart from Momma. 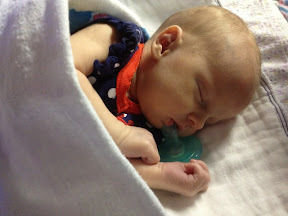 I expected to room in with her at the hospital and take her home in a couple days, but she had her own plans. She had a little snort in her breathing that became rapid and labored as the day went on. 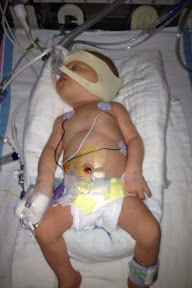 At 10:15pm the pediatrician said she needed to be transferred to a NICU. 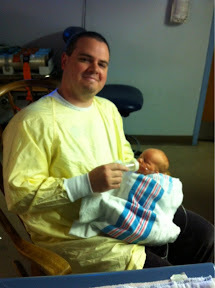 Cabell was full so she had to go to CAMC Women and Children's Hospital in Charleston. Tyler went with her and stayed in the Ronald McDonald house until Sunday. Needless to say, I was a mess. 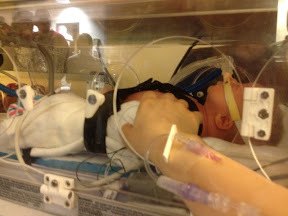 This is her in the incubator/stretcher thingy as I said goodbye. 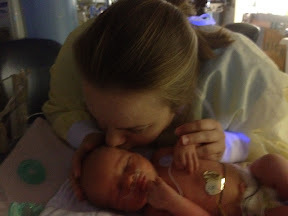 It was made even harder by the fact that I hadn't even held her yet. 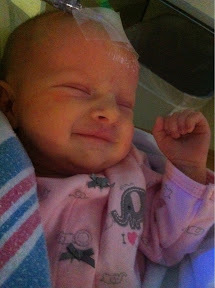 She was put on a CPAP for a day or so. And then on a nasal canula for about 4 or 5 days. 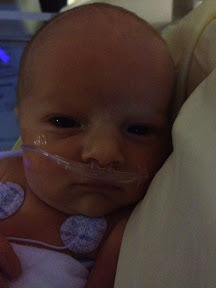 She didn't get to eat until Thursday, though she had an IV giving her what she needed, and was pretty cranky as a result. She would get VERY agitated every time any of the other kids' alarms would go off. It was funny to watch. I finally got to hold her on Thursday! 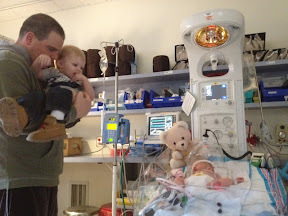 When we got there on Sunday her IV had been moved from her arm to her head. I prefer this spot because you already take care not to bump their head and they have a much harder time pulling it out themselves. Tyler, on the other hand, becomes a nervous wreck. My mom said the princess got a tiara. We didn't expect her to come home until Tuesday or Wednesday because they decided she also had pneumonia and had to have 7 days of antibiotics. 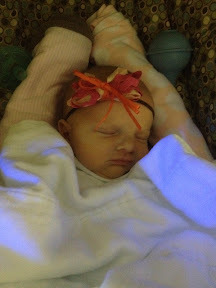 So imagine my shock when at 10:30am on Monday (her 1 week birthday!) I get a call that we could pick her up that evening! I was ecstatic. When I got there she was just sleeping like it was any other day. I got her dressed and the hospital took her picture (those will come in another post when I get them) and then headed back to Huntington to start our new life as a family of 4.